but there are a couple of problems. Data is returned in JSON and would need remapping to RSS. The real deal breaker, which is highlighted if you click on the link above, is you need to register for an API key from Google’s API Console to get the the data. So at this point I could setup a service to convert Google+ Searches into RSS feeds (and someone may have already done this), show you how to do it via the Console or show you some other way. For now I’m opting for ‘another way’. Using the same trick in Tracking activity: Diigo site bookmark activity data in a Google Spreadsheet (who is saving your stuff) we can extract some information from a Google+ Search page like this one into a Google Spreadsheet using the importXML function and XPath queries to pull out part of the page (here are parts of the same search pulled into a Google Spreadsheet). There is an option to publish a Google Spreadsheet as RSS or ATOM but it’s not structured in the same way as for a blog feed (title is a cell reference etc. like this). What we need is a way to trick Google into formatting the data in a different way. As part of the Google Earth Outreach project a Spreadsheet Mapper was developed. This spreadsheet template allows you to enter geographic data which is automatically formatted as KML data (KML is another XML language for presenting geo data). This is achieved by creating a KML template within the spreadsheet and using the plain text output as KML. 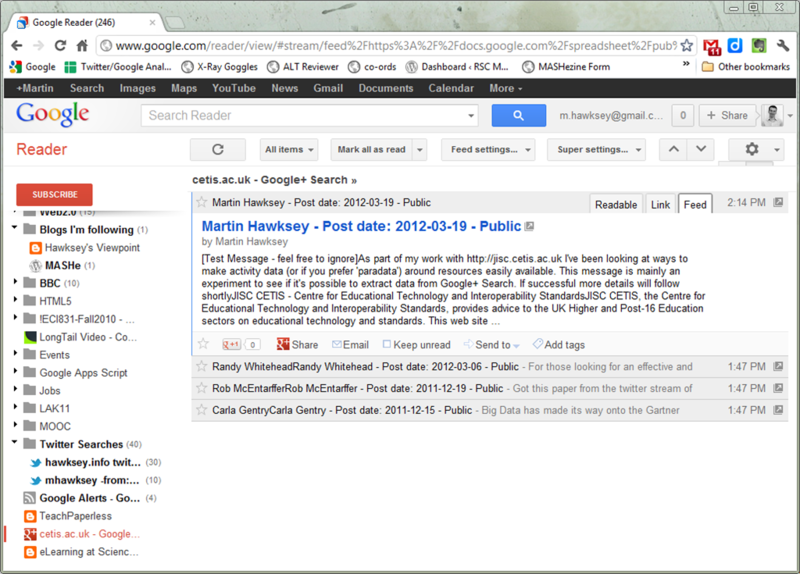 Entering a search term and publishing the spreadsheet gives me a custom RSS feed of activity data. 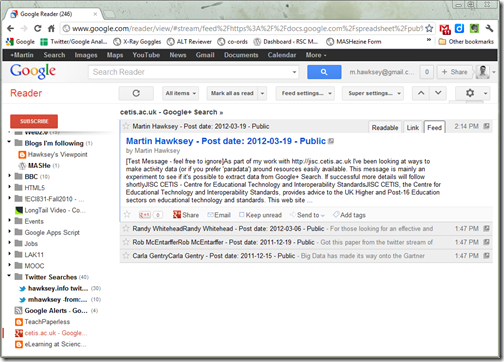 This feed works in Google Reader (haven’t tested any others), and with Reader we have the benefit of the results being cached (still not sure what the limitations are). Important: Some things to be aware of. Because the data for this is extracted using XPath when Google change the page styling this solution probably won’t work anymore. Also the RSS feed being produced is for the last 10 search items. If you’ve got an active term then data might get lost. So yet more resource based activity/paradata for you to digest! Next Post: Google Analytics rolling out social network activity streams: Paradata heaven?